Our new black lab pup, Spencer, is the smartest dog I’ve ever raised. He learned to sit at six weeks of age, and was potty trained shortly thereafter. In the winter! Of course all puppies like to chew on wood, so when I split firewood, Spencer was right there to grab a chunk and chew on it. So AH HA, I thought. Why not teach him to bring in firewood???? So first I’d just encourage him to bring in his little piece of wood. Then I’d pick up a small, handy sized piece and give it to him and praise him when he’d carry it awhile toward the house. Then I’d encourage him to carry it while I carried in an armload of wood, always giving him a dog biscuit when he made it all the way into the house. Now he picks up his own wood! When I do horse chores, he roams the pasture and picks up a chunk to bring home. 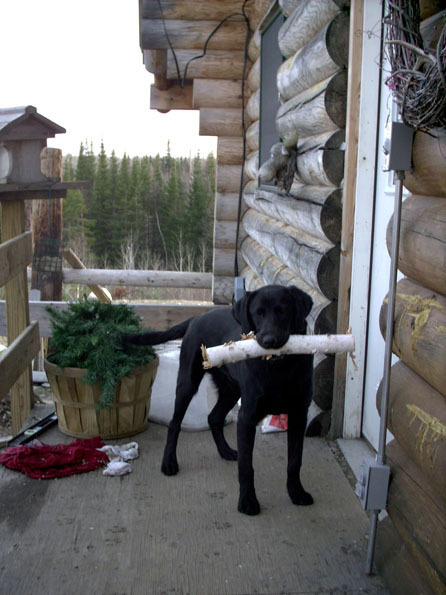 Or when I split wood, he grabs a nice piece and trots right up to the door and waits for me to open it. Now if I can just teach him to put it into the stove!!! Oh well, I’m happy with his progress so far. I’ll bet before long I can open the door, point to the wood pile and tell him to get firewood. Won’t be much longer, I think. It’s so much fun to teach him and he enjoys the learning. He always has a big smile on his face. Love your column and blog. Thought I’d share a similar experience I had with nursery plants from a seed company. Last year, Shumway sent our strawberry plants waaaaay too early for No. Mn. and most rotted before it was time to plant. They were true to their word and gave me a credit for all the plants that failed. This year when I called in my order for seeds and the replacement plants, they told me the planned ship date for the strawberries. I explained that the date would be much to early and that that was why I was using a credit. The nice lady asked, ” okay, when *would* you like us to ship?” Funny. All these years we struggled with keeping nursery stock alive until it was time to plant and all I had to do was ask! Maybe Gurney’s will be just as helpful for you next time. Keep up the great work! What brand and size pressure canner do you recommend to a beginner? I want to can meat and chicken and turkey very soon. Are european jars more economical over time or are Ball or Kerr jars most economical. You are awesome. Thank you for sharing your wisdom. Enjoyed your article in #111 – especially the statement “smart, huh?”. you are so real and down to earth. I want to add limestone (pulverized) to my raised beds to help prevent blossom end rot. I have 2 beds each is 4 ft x 10 feet. the bag I bought only gives amounts for huge gardens. How much should I add? Can too much be bad? Really enjoyed all your articles in the recent “Economic Squeeze” edition. tomato plant produce big tomato’s? Having grown up on a farm and having moved around a bit, one would think that I would not have a bit of trepidation. However, I am concerned about the much higher cost of living (compared to here we live now), the high elevation and being only zone 4 (even though I am an experienced gardener and avid reader/researcher), relocation costs (even though we’ve been saving for them – they lways end up being excessive), and moving the teenagers. I have read all of your advice for years and have followed much of the advance preparation parts. I would like to see if you have any last minute tips for our family? We are not taking any livestock as we are moving from a town lifestyle. Of course you have concerns! Anyone with half a brain will, when changing homes so drastically. But we did it, and so can you. Keep your family communications open and ask that everyone help in the tightening up, when needed, and pitching in to make your new home a great one. (So your kids want to have a game room that looks like a jail! Do it. Or they want a round garden of their own.) Treat them like adults and they’ll surprise you. As for the elevation; no problems for most people. We moved from 1,200 feet to 7,400 feet and the only differences I could see were that I huffed and puffed while climing steep hills more and my potatoes took longer to get soft when I boiled them. No biggie. Of course I had to can my foods at a higher pressure than when we lived on the “flat”. I am making navy bean soup using a ham bone. How can I can the rest? I do not have freezer space. We live in northern Wisconsin near a large national forest. We also garden and grow most of our own veggies to can. However, not only do we have snow in April, but we also have a problem with the neighborhood deer. Our gardens are carved out of an area between large pines and maples – this makes the sunny areas not contiguous and difficult to fence conventionally. We’ve used net fencing and deer spray, put up strands of fishing line for the deer to run into, tried having the dogs do their thing on the perimeter of our land, but nothing has helped. This year we’re going to put conventional fencing around at least 3 sides of our two largest gardens, but that still leaves an opening. This year the lilacs are showing buds and the deer have already sampled them. Last year they at least waited until they leafed out. I’ve found some new stuff that has cloves, garlic, dried blood and meat meal to spread around the perimeter, but that’s really expensive. (The dogs think it tastes just fine!) Any ideas? About the best “spray” product against deer is Liquid Fence, but it’s not 100% effective. I’m sorry, but the only safe anti deer protection is to totally fence in your garden area. For us that means fencing in not only our garden, but our orchard and our entire house yard. I’ve been buying fence all year, and finally have enough to do it. It’s NOT cheap, but it does keep them out. You’ll need 6′ high welded 2″x4″ 14 gauge wire fencing and 8′ T posts. Luckily, my last 3 rolls I got on a half-price sale at our local L&M Supply. No more “Where did the flowers go? Oh no. Not the green beans!!!”. I am getting plenty of eggs this year and want to know is there any other way to can them besides pickeling? Spencer is great, Jackie, and what a wonderful photo! SO cute, and smart, too! You’re lucky to have him, and he’s lucky to have you all! Hello, I.m new at country living, and as I near retirement, i’m looking forward to the hard work, but very rewarding life style. Last year all the trees that i planted were stripped down to the bark, now I built a small fence around the tree and it seems to keep the contents out of reach. But the most amazing thing is, the ones that were left uncovered, for identification purpose, i had placed a small stake close to the plant, and placed one of those plastic red flags that the stores give away and to my surprise those plants have not been touched, I guess that the flapping of the wind is keeping them away. The book “Storey’s Basic Country Skills” has a list of ways to preserve eggs with or without refrigeration. None are exactly canning, but if long-term storage is the goal, it’s worth a look. BTW Jackie, you’re one of my heroes. I read all the backwoods home blogs and even when there is a new one, does not happen any where near often enough, I still check several times a day to see if it has been added to yet. Even when there is a new one I keep checking. I need to get a life. Love your blog, Jackie. I recommended it to my sister. She just started canning, and now is going crazy! Canning everything in sight, nothing is safe! She lives in Texas and is already harvesting–I’m so jealous. Note to fellow commenter Patricia–Bon Voyage and Good Luck! What an adventure!